Who's drinking the tea party? I'm an expatriate, but I've never subscribed to the whole "I left America because I hate it" notion of being an American living overseas. We moved to New Zealand because of family, and because hey, it'd be neat to live in a foreign country for a while, however long it ends up being for. George Bush being President had nothing to do with it. But I love many many things about the US, miss it a lot, and usually stick up for it when I get the occasional "America-bashing" comment from people here. But I admit -- I don't understand this "Tea Party" nonsense or the school of Sarah Palinism at all. The incoherent rage and anger of people like the Glenn Becks and Bill O'Reillys and so forth is bizarre to me. There are people on the Republican end of things I've respected, but they seem to be a dwindling voice amongst the crazies. People on both sides of the political divide get angry and idiotic, but I don't know, it just seems like the American right wing has a patent on over-the-top lunacy. Living overseas, I see everything now through a curious filter of distance. I wonder, are people really getting crazier, or is that just the way it seems from afar? I end up often feeling like I need to apologise for my country, or trying to explain to people that a politician or a talk show host does not equal a country. When you get people like Sarah Palin saying things like 'Don't retreat, just reload," and you think about the likelihood that a certain amount of disturbed, gun-owning people are likely to take that as more than just rhetoric, you have to wonder. If left-wingers talked about shooting Bush, they rightfully would've been prosecuted. It's hard to imagine endlessly red-faced, violence-invoking rhetoric isn't going to lead to real trouble. I dunno. Maybe it's just the up and down of politics as always (people have been shouting about politics as long as they've had larynxes, after all). Maybe the Internet, the Twittery and Facebookery and so forth just make everything that much louder and less avoidable. I try to tell my NZ friends that all Americans aren't like the Palinites -- that the Tea Party folk just are a very vocal, very loud fringe element that gets a lot more press than the number of people they actually represent. 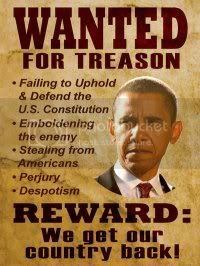 But maybe I've been out of America too long and the lunatics have actually taken over the asylum. Can anyone tell me? Alex Chilton is dead, and lordy does it hurt to type those words. For a certain stripe of pop fan, he was kind of like our Bob Dylan or Leonard Cohen, and when I heard he'd died today at the too-young age of 59, of an apparent heart attack, I was stopped stone-cold. It's been a crappy kind of week anyway, and Alex Chilton should never die. 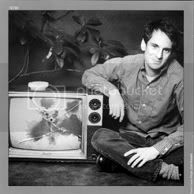 Michael Jackson dying, yeah, kind of saw that coming, but Alex Chilton was the voice of heartbreak and strained emotion and man, he just shouldn't be dead, y'know? I discovered Chilton's never-quite-made-it 1970s band Big Star in the 1990s, when I was living near Memphis, Tennessee, their home town. Big Star were a cult fetish for music nerds, with their blend of power pop, rock chops and lyrical truth. It's taken years, decades, for them to get their due -- the awesome box set of pretty much everything they did, "Keep An Eye On The Sky," was one of the best music albums of last year or any year, really. You listen to a Big Star song, and you think, man, why have I never heard of these guys? And I can't find the lines"
Read it on the page and it sounds like generic teenage angst, maybe, but man, Alex Chilton SELLS that sentiment and if you've ever been 16 years old and digging that person so much your stomach boils, you know the feeling. Big Star and Alex Chilton touched that moment and always sold it, always made it feel real. Over their three-year recording career their songs ran the gamut from teen-bop of "Don't Lie To Me" to the dark, glistening sorrow of songs like "Holocaust." Endlessly contrarian, Chilton's post-Big Star career was a strange twisty journey -- he seemed to spurn the fame he could've had -- but he never stopped playing -- he was going to play with the reformed Big Star this weekend. There's a tribute song by The Replacements that'll be played thousands of times by Chilton fans in coming days -- as heartfelt as any of Chilton's best, it's an homage to a cult artist who should've been a household name but never quite was, but that doesn't really matter. It's a valentine to a secret idol, a star who's huge in your own personal universe and you don't care if anyone's never heard of him. 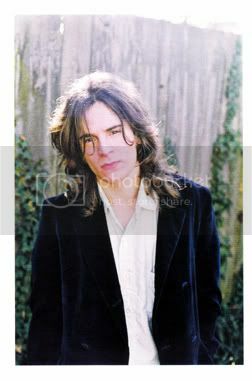 In my mind, Alex Chilton will always be a Big Star. Everyone knows about Superman, Spider-Man, Batman and Wolverine. But one of the things that keeps me hooked on comics is the sheer variety of goofy, semi-obscure superheroes out there. Here's one of a series of occasional looks at lesser-known characters I've always dug. Who: The Man-Thing, a swamp monster who first appeared in 1971. What: A scientist transformed in a horrible lab accident -- you know how it goes -- into a mindless, shambling muck monster, who feeds off human emotions. Haunts the Florida Everglades, ends up in lots of strange magical-inspired escapades. Catchphrase: "Whatever knows fear burns at the Man-Thing's touch!" 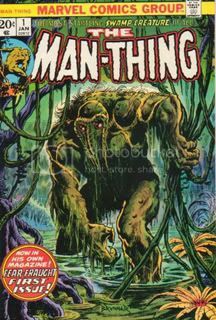 Why I dig: There's something about Man-Thing I've always liked, even if his name is vaguely giggle-inducing. (And we won't even get into the short-lived series "Giant-Sized Man-Thing," source of more comic geek jokes than you could fill a barn with.) I've always liked his bizarre design, kind of a pile of muck with a carrot for a nose and dreadlocks. He was created around the same time as DC Comics' "Swamp Thing," but has been used in rather different ways over the years. He's less a character than a catalyst -- there's a challenge in writing a story around a mute, basically brain-dead protagonist, who basically just reacts to events and puts plots in motion. But the best stories, by the late, great Steve Gerber, use Man-Thing as a pivot to tackle themes of all stripes. You'll find Man-Thing used in ghost stories, religious parables, environmental spiels, wacked-out pirate tales. Gerber had a knack for using Man-Thing's empathic nature as a mirror to reflect man's own lunacy, and was probably the best writer by far to tackle the character. Although his heyday was in the 1970s, he's even been used fairly successfully in more straightforward superhero tales -- one of my favorite "Marvel Team-Up" issues pitted Spider-Man in a gooey battle against Man-Thing. Sure, it's a funny name -- Man-Thing, tee-hee! -- but the muck monster has yielded some great stories. 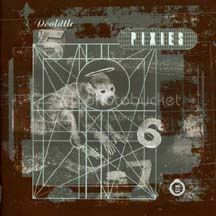 So last night was alt-rock legends The Pixies' very first tour in New Zealand, like, ever, on the road on their never-ending reunion tour, this time playing their 1989 classic album "Doolittle" straight through, beginning to end. They pretty much sold out the massive 12,000-seat Vector Arena, filled to the brim with former hipsters-now parents like myself (fun game -- count the balding 30-something blokes with shaved heads! Pretend they're all clones!). NZ has been waiting a LONG time for Pixie love -- I know several people that were practically buzzing out of their seats all week in anticipation. And it was awesome good fun, with Frank Black, Kim Deal and co. slashing out the riffs, yelps and screams like it was 1990 all over again. 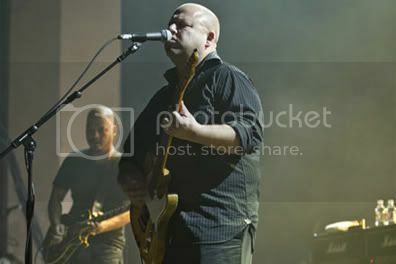 It was a bit of deja vu for Avril and I as we were (probably) one of the few there who'd actually seen the Pixies live since they reformed in 2004 -- we caught them on one of their very first gigs almost exactly six years ago back in Oregon. So we didn't have the shock of novelty going for us, but it was quite interesting to contrast seeing them at a 1,200-seat club vs at a cavernous 12,000 capacity arena. We definitely had better views at Eugene, where the band was a bit looser (Joey Santiago doing an impressively fun series of impromptu guitar solos), but Auckland's show was a prime spectacle -- there was something quite awesome about seeing so many thousands of people so totally into the definitive "cult" band, singing along to grotesque and weird anthems like "Debaser," "Gouge Away" and "Hey." They were smoothly professional with just enough of a gritty edge to not seem like a total cash-in reunion tour, and the two encores were awesome, with fantastic versions of "Into The White" and "U-Mass." I'm just too darned old for the front row, but I actually like sitting a bit back from the stage and seeing the sweep of hundreds of heads bobbing, hands waving. Kim Deal was the definition of rock-chick cool, Frank Black screamed so much I thought his throat would explode, and we all thrashed away. We also had the fun of people watching -- as usual there were a fair percentage of goofs who seemed to just show up to spend $100 on tickets, get as drunk as humanly possible on $8 beers, then get thrown out (the guy who got tossed out during the second song was tied for 'Winner of the Night' with the other guy who tried to vault a fence into the pit and did an amazingly epic face-plant on the concrete floor instead). To blog or not to blog? ... The question that's been rattling about these last 10 weeks or so since I 'gave up' regular posting on here. I tend to over-think most things that aren't really important enough to overthink, so the question of whether I should keep blogging or not took up a lot of brain space the last couple months of 2009. 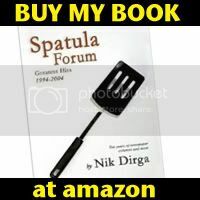 In the end I thought I'd pull the plug on "Spatula Forum." But I kept feeling that itch to express myself, and while I've also done other creative type pursuits -- taken up sketching a bit more, done various freelance movie and book reviews for papers down here -- in the end the free-form, whatever-the-hell I want to say allure of a blog is mighty compelling. I placed arbitrary "rules" on myself about how much I should post and I think that contributed to a lot of my feeling burned out by the whole thing at the end of the year. So anyway. After seeing Pavement last week I felt darned itchy, wanting that outlet to blather about the cool gig -- brief comments on Facebook aren't really enough. 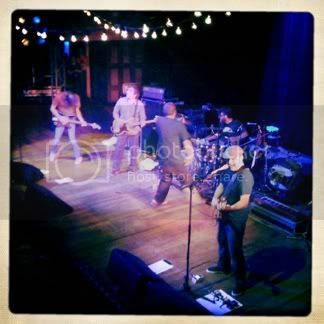 The itch only went away when I just rambled out a little blog entry on it (and it was cool to see the several hundred hits I got writing a review of a well-known indie rock band's first gig in 10 years). So I'll dust off the blog, change the design a bit (I've switched from Haloscan commenting so all the old comments are going away, I'm afraid), and I'll scratch this itch sometimes, putting aside any self-defeating notions of "how much" I should blog (a lesson I shoulda learned in 6 years of doing this, I know) and just doing it when and where and why I feel like it. That's why the Internet was put here in the first place, ain't it? 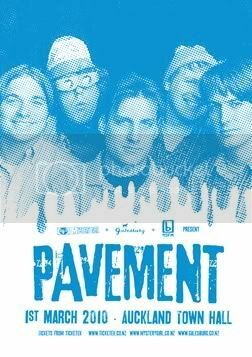 One of my favorite bands of the 1990s was Pavement, that Stockton, California quirk-rock band who combined surrealism with grunge-rock chops and indie low-fi weirdness. So it was pretty damned awesome to be in the crowd last night to see the reunited band do their first show in 10 years, kicking off a worldwide tour down here in Auckland with an awesome opening set by also-reunited local alt-rock icons The 3Ds. I came to Pavement a bit later in their heyday -- my favorite album has always been their emotional fourth one, "Brighten The Corners," which I played in extremely heavy rotation in my own chaotic personal summer of 1997 -- but I made up for it later by grabbing up all their discs (and also Stephen Malkmus' own excellent later solo work). Since they broke up in 1999, I'd kind of imagined I'd never see them live. But no band stays dead forever these days unless it's The Smiths. Only 1600 or so of us could fit in to see Pavement at the full Town Hall, and it was a great teaser for what folks at mega-festivals like Coachella will see later this year. Despite a decade off, they're in awesome form, with frontman Stephen Malkmus seemingly ageless, a steam-of-consciousness poet in a preppy's body. Over a two-hour set with an encore they played all their "hits" -- catchy alt-rock anthems that were on high rotation in college radio back in the glorious '90s -- "Cut Your Hair," "Gold Soundz," "Shady Lane," "Range Life." Long live Pavement -- the rest of the world will soon get to see what New Zealand saw last night. It's nice to be first sometimes! ** Very nice show photo inelegantly borrowed from blogger Piero who was there too.